proposed the first general mechanical computer, the Analytical Engine. The Analytical Engine contained an Arithmetic Logic Unit (ALU), basic flow control, and integrated memory and is the first general-purpose computer concept. Unfortunately, because of funding issues this computer was also never built while Charles Babbage's was alive. 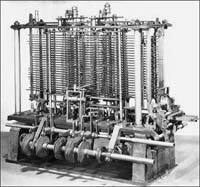 In 1910, Henry Babbage, Charles Babbage's youngest son was able to complete a portion of this machine and was able to perform basic calculations. Eckert and Mauchly was invalid and named Atanasoff the inventor of the electronic digital computer. 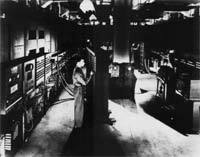 The ENIAC was invented by J. Presper Eckert and John Mauchly at the University of Pennsylvania and began construction in 1943 and was not completed until 1946. It occupied about 1,800 square feet and used about 18,000 vacuum tubes, weighing almost 50 tons. Although the Judge ruled that the ABC computer was the first digital computer, many still consider the ENIAC to be the first digital computer because it was fully functional. The first stored program computer The early British computer known as the EDSAC is considered to be the first stored program electronic computer. The computer performed its first calculation on May 6, 1949 and was the computer that ran the first graphical computer game, nicknamed "Baby". The first computer company The first computer company was the Electronic Controls Company and was founded in 1949 by J. Presper Eckert and John Mauchly, the same individuals who helped create the ENIAC computer. The company was later renamed to EMCC or Eckert-Mauchly Computer Corporation and released a series of mainframe computers under the UNIVAC name. First stored program computer First delivered to the United States Government in 1950, the UNIVAC 1101 or ERA 1101 is considered to be the first computer that was capable of storing and running a program from memory. First commercial computer In 1942, Konrad Zuse begin working on the Z4, which later became the first commercial computer after being sold to Eduard Stiefel a mathematician of the Swiss Federal Institute of Technology Zurich on July 12, 1950. The first PC (IBM compatible) computer On April 7, 1953 IBM publicly introduced the 701, its first electric computer and first mass produced computer. Later IBM introduced its first personal computer called the IBM PC in 1981. The computer was code named and still sometimes referred to as the Acorn and had a 8088 processor, 16 KB of memory, which was expandable to 256 and utilizing MS-DOS. The first computer with RAM MIT introduces the Whirlwind machine on March 8, 1955, a revolutionary computer that was the first digital computer with magnetic core RAM and real-time graphics. 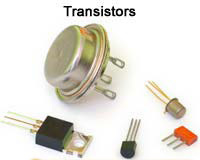 The first transistor computer The TX-O (Transistorized Experimental computer) is the first transistorized computer to be demonstrated at the Massachusetts Institute of Technology in 1956. The first minicomputer In 1960, Digital Equipment Corporation released its first of many PDP computers the PDP-1. The first mass-market PC In 1968, Hewlett Packard began marketing the first mass-marketed PC, the HP 9100A. The first workstation Although it was never sold, the first workstation is considered to be the Xerox Alto, introduced in 1974. The computer was revolutionary for its time and included a fully functional computer, display, and mouse. The computer operated like many computers today utilizing windows, menus and icons as an interface to its operating system. The first microprocessor Intel introduces the first microprocessor, the Intel 4004 on November 15, 1971. The first personal computer In 1975, Ed Roberts coined the term "personal computer" when he introduced the Altair 8800. Although the first personal computer is considered by many to be the Kenback-1, which was first introduced for $750 in 1971. The computer relied on a series of switches for inputting data and output data by turning on and off a series of lights. The Micral is considered the be the first commercial non-assembly computer. The computer used the Intel 8008 processor and sold for $1,750 in 1973. The first laptop or portable computer The IBM 5100 is the first portable computer, which was released on September 1975. The computer weighed 55 pounds and had a five inch CRT display, tape drive, 1.9MHz PALM processor, and 64KB of RAM. In the picture to the right, is an ad of the IBM 5100 taken from a November 1975 issue of Scientific America. The first truly portable computer or laptop is considered to be the Osborne I, which was released on April 1981 and developed by Adam Osborne. The Osborne I was developed by Adam Osborne and weighed 24.5 pounds, had a 5-inch display, 64 KB of memory, two 5 1/4" floppy drives, ran the CP/M 2.2 operating system, included a modem, and cost US$179. The IBM PC Division (PCD) later released the IBM portable in 1984, it's first portable computer that weighed in at 30 pounds. 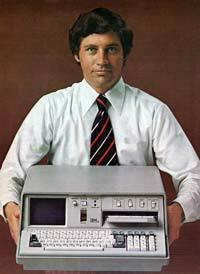 Later in 1986, IBM PCD announced it's first laptop computer, the PC Convertible, weighing 12 pounds. Finally, in 1994, IBM introduced the IBM ThinkPad 775CD, the first notebook with an integrated CD-ROM. The first Apple computer Steve Wozniak designed the first Apple known as the Apple I computer in 1976. The first PC clone The Compaq Portable is considered to be the first PC clone and was release in March 1983 by Compaq. The Compaq Portable was 100% compatible with IBM computers and was capable of running any software developed for IBM computers. The first multimedia computer In 1992, Tandy Radio Shack becomes one of the first companies to release a computer based on the MPC standard with its introduction of the M2500 XL/2 and M4020 SX computers.Other major computer company firsts Below is a listing of some of the major computers companies first computers. Compaq - In March 1983, Compaq released its first computer and the first 100% IBM compatible computer the "Compaq Portable."